As my first week working with Rathbone comes to a close, I’ve found a few minutes to blog about some of the things I’ve done and would like to share with you. My first day at Rathbone was spent getting acquainted with staff, facilities and the projects I’ll be completing over the course of my placement. I soon felt at ease and part of the team: the charity has only four full-time staff working at the Old Library site, who were all extremely welcoming and helpful, taking time to explain what their roles in the organisation entail and the many services offered by Rathbone. My fundraising work this week started with completing an application for the Achievement Awards grant by the Jack Petchey Foundation. If successful, the foundation will provide Rathbone with regular £200 awards to be given to a young person, as nominated by their peers, who is a good role model, has overcome personal challenges or has helped others over and above expectations. The money will be reinvested in the form of equipment, trips or anything the young person feels would benefit the organisation. This has given me a unique insight into the inner workings of the charity, particularly into management structure and finances, as in the process of gathering the required information I analysed a number of financial reports and statements from the Board of Trustees. 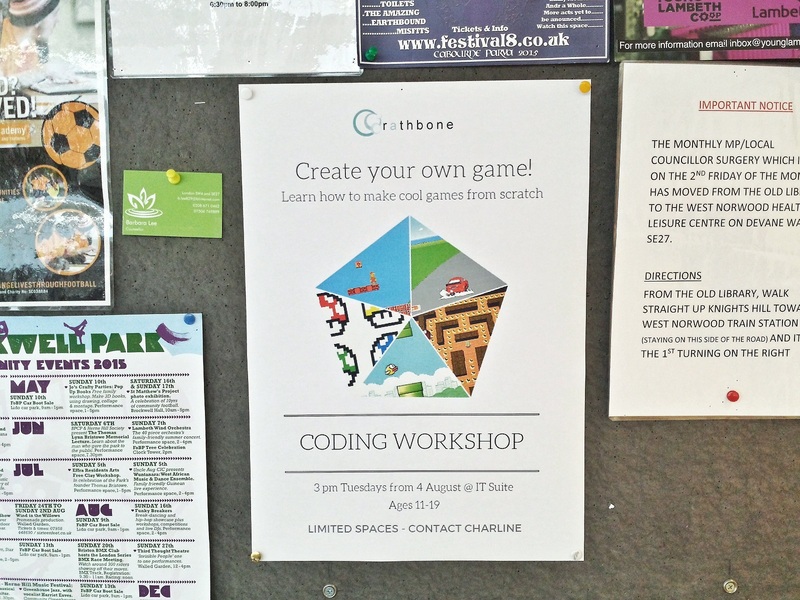 Preparations for the programming workshop are already under way; I’ve set a start date and designed a poster to be hung on the main noticeboard close to the entrance – I’m quite happy with the result! I will be getting in touch with young people and signing them up over the upcoming week. Along with the personal satisfaction that comes with learning a new skill, I wanted this workshop to give young people the chance to gain formal recognition for their achievements; to this end I’ve found a suitable proposition: the AQA Unit Award scheme. Originally devised as a way of accrediting the achievement of students who were disengaged from education yet who still could achieve short units of work, it is now used in a wide variety of organisations and in a diverse range of subjects, from budgeting and debt management to employability skills. I came across a group of 8 units aptly named “Programming with Scratch”, with a structure ideal for teaching over the course of three weeks, starting with basic if-then constructs and gradually leading to the creation of a fully-fledged game. I look forward to starting the final preparations next week, and hope young people will be as enthusiastic about it as I am!